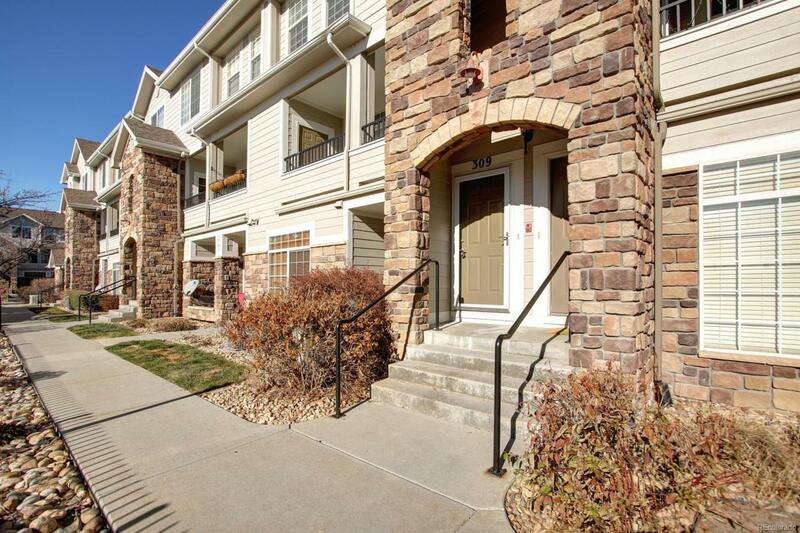 Attractive two BR, two BA townhouse at Terra Lago with 1292 sq. ft, one car detached garage + 1 reserved parking space. Contemporary, open plan, well cared for with deck (+ storage closet), architectural details; central air; newer carpeting and paint; upper laundry, W/D incl. South facing, sunny interior washes the family room with natural light, fireplace and art niches, overlooking the pool, clubhouse and fully equipped gym. Spacious kitchen includes all appliances, plenty of counter space and a walk in pantry with extra storage space. Master offers two closets, incl a walk-in; two sinks, oversized soaking tub with shower. Newer water heater & furnace fan (impt component). Secondary BR adjacent to full bath. HOA covers pool w/hot tub, clubhouse with fitness center, exterior maintenance, incl roof, snow removal, water & trash! Smoke and pet free. Great location, close to shopping, recreation, restaurants and the new Premier Shopping Outlets. Quick access to DIA and Denver.